I remember this day well. My father, a keen photographer took this photograph on the beach in Folkestone in 1945/6 with his ensign camera which now sits on my welsh dresser . 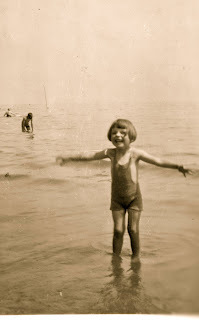 It is by far my favourite photograph, my arms outstretched, welcoming , not a care in the world as the camera clicks I am not sure how this blog will go , I have an idea that it will dip in and out of time...be patient it might be fun !I invite you to join me . I have a similar "cossie" will try to find the photo> Happy Days !! !